Oops. Didn’t get this one up in time. Sorry ’bout that. Much of my facebook, twitter feed, and bloglist yesterday was consumed with thoughts and comments about the much-anticipated Royal Wedding. Me? My toddler chose to sleep in until 7:45 (!?!) yesterday morning, and so…I did, too. Which means that I didn’t watch the events live. The Toddler got up, and I convinced her to watch the balcony kiss, only by telling her to look for the princess, and then wave at the “princess” when she emerged. As soon as that was over, The Toddler asked if she could watch Thomas. And that was the extent of our girly moment. Despite her looks (blond, blue-eyed, and on the petite side), The Toddler is rough and tumble. She can’t wait until her Daddy gets home so that he will run, and jump, and chase and wrestle with her in the way only daddies can. That rough-and-tumble personality is reflected on her bookshelf, too. There are some typically girly titles, but there are also books about Thomas the Tank Engine (a favorite! ), dump trucks, dinosaurs, and airplanes. And while sometimes I’ll admit I wish she showed more interest in Fancy Nancy than Baby’s 1st Trucks, it’s all part of who she is, and learning about her world. So we read the dump truck book. Repeatedly. And every once in awhile? We read the dump truck book while wearing a princess dress-up gown. Guess there’s a little bit of girly-girl in there after all. What do you think? Does your bookshelf reflect a wide variety of preferences? Does your child have a strong passion for a particular subject? Sound off! The Toddler received a Thomas the Tank Engine book for her birthday last week. Since then, she has not fallen asleep without this book by her side. When I was going through school, I read just about everything I could get my hands on. Books, magazines, comics, you name it. But poetry? Not on my radar. I mean, I knew of the genre, but had zero interest in absorbing it. I’m sure it came up periodically throughout my public school education, but to be honest, I don’t really remember it being part of the curriculum until I was in high school, disecting epic poems and preparing for the AP exam. Fast-forward to my first year of teaching. I was assigned a fifth grade classroom. Lo and behold, not only was “elements of poetry” part of the curriculum, it was a main component on the almighty standardized test for that year. Alright. If I have to teach it, I have to teach it. But there had to be a way to make the unit fun, and not the dry, analytical approach to poetry I’d been exposed to in the past. So I set out to gather materials that would appeal to my fifth graders. And discovered a whole new world. In the following years, I further developed my poetry unit, and then began including poetry in our reading selections throughout the year. My students loved it. Below are some of the the selections I used in my classroom. They are just a tiny drop in the ocean of poetry books out there. If you’re interest is piqued, there’s no better time to dive in than National Poetry Month. Yup, that Dean Koontz. But if you’re anticipating thrill and suspense, you’re in for a surprise. Here, Koontz displays his funny side with a collection of 64 holiday poems. The subjects range from the familiar (Halloween, Kwanzaa, Rosh Hashanah), to the more obscure (Diwali, Sakura Matsuki). If you’re looking for a way to incorporate poetry year-round, this one deserves a place on your shelf. Ages 8-12. This collection of 12 poems offers solutions to the world’s most pressing problems. From finding a lost shoe, to stopping animal odors, to building homes for bugs, poet Andrea Perry has covered it all. Whether I read these poems aloud, or gave students copies of the book so that they could enjoy Snow’s amusing illustrations, this book was always a hit. I used these poems in both my fourth and fifth grade classrooms as examples before students wrote their own “problem-solving” poems. Ages 8-10. It’s just a given that if you’re teaching poetry to young students, Jack Prelutsky is on the list. Combine this with illustrations by Caldecott award-winning Zelinsky, and you can’t go wrong. This series of poems follow the poor Awful Ogre from the moment he rises to be attacked by a rattlesnake, buzzard, and tarantula, to the moment he falls back asleep in his bed, only to be haunted by a dream of a beautiful day complete with kittens and butterflies. Ages 6-10. While contemporary poets often provide a hook when introducing students to poetry, it’s important that students also receive some exposure to the classics. This collection of poems inspires students to write and create, using the words of poetry greats such as Emily Dickinson, Carl Sandburg, and Nikki Grimes. The bright, bold illustrations are worth perusal, too. Great selection for incorporation into Writer’s Workshop. Ages 6-10. The sheer amount of information my fifth graders were expected to cover in order to prepare for the standardized test in May was overwhelming. Poetry was a large part of the Reading exam, but students also needed to be familiar with specific elements of a wide variety of genres, including fairytales, folktales, science fiction, fantasy, realistic fiction, historical fiction… you get the picture. Books like Cinder-Elly are a teacher’s best friend–a way to combine 2 genres into one lesson. Many times, students hear the traditional versions of stories since kindergarten. This modern-day, urban retelling of Cinderella is refreshing, while still maintaining the elements important to the genre. Ages 6-10. Some people read The Post, some people The Times. This is Sunday morning at our house. Welcome back to Friday! It’s a little cool to be considered spring-like today, but the sun is out, and I don’t have to wear a heavy winter coat and gloves, so I’m hopeful! How has YOUR week been? If you take a little journey around the blog, it would seem that every book I read gets glowing reviews. The truth is, not every book I pick up, whether it be an adult read or children’s literature, is my cup of tea. Several times I’ve scanned the library catalog or shelves, picked up something that looked interesting, taken it home, and discovered that it was boring, had glaring errors, or contained a message that didn’t sit well with me. Chances are, you won’t ever read about those books here. If I don’t think it’s a winner, I don’t want to advertise it to the general public. There are so many wonderful stories out there to share…why spend time discussing those that don’t quite make the cut? Every once in awhile, there’s a book that achieves incredible accolades among the powers-that-be in the literacy world. So I read it. And I just can’t get into it. An example? Well sure, since you asked. Over and over again, I’ve read interviews with adults who claim Maurice Sendak’s Where the Wild Things Are to be their most favorite children’s book ever. Me? I recognize the talent in the story, but it’s just not up there on my top 10 list. I much prefer Sendak’s talent as an illustrator, especially when viewing the Little Bear series by Else Holmelund Minarik, or A Very Special House by Ruth Krauss. Another example? Kate DiCamillo’s Because of Winn-Dixie. I have likely read this book four or five times now, for various reasons. While a nice read, I prefer The Tale of Despereaux or The Magician’s Elephant. Yet these are not the DiCamillo novels that appear in literature classes or are immediately associated with her name. All this to say, reading is a personal venture. While book recommendations, reviews, and bestseller lists my guide our choices, our personal preferences come into play, too. So I’ll keep following those reviews, picking up new reads, and giving them a try. But if they don’t work for me? I’m pretty sure something else out there will. 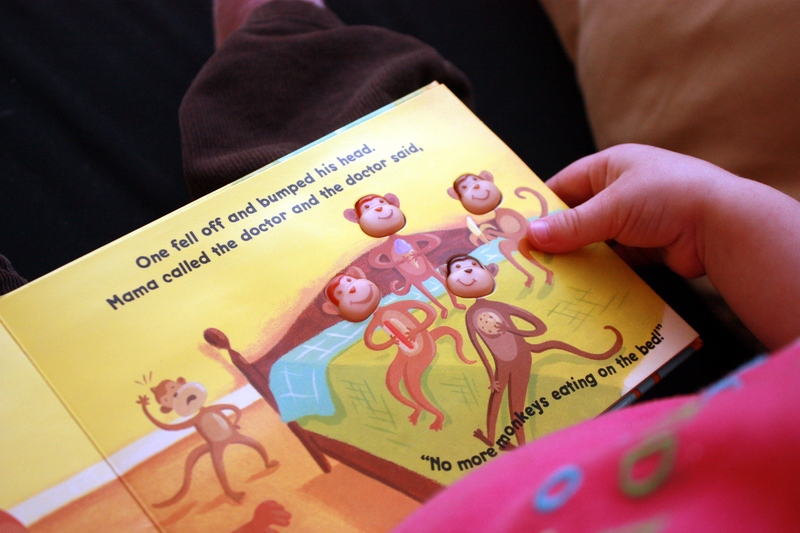 Here’s my monkey reading her new “Ooh-ah” (that’s “monkey” in Toddlerese) book. Don’t you love those smiling monkey faces? I’ll be back tomorrow to tell you where this book came from! Welcome back to Friday Confessions! This Friday, it’s all about me. My confession, that is. I buy books under the pretense of buying them for my daughter. But that’s not so bad, right? I mean, she may enjoy them someday, who knows? And the answer is, yes. Yes, we did. The thing is, I love stocking our bookshelves with books from my own childhood. I want her to read Dr. Seuss, and Eric Carle, Cynthia Rylant, and Marcus Pfister. As she grows, I have Beverly Cleary, Judy Blume, and Lois Lowry at the ready. I buy them from clearance racks to feed her current interests. We have books on animals of all kinds, on dump trucks, and on things you find in a purse. We have books about Christmas, and Easter, and Thanksgiving, and Halloween. Besides including books as her gift for every major holiday, I also give them to my husband for Christmas, his birthday, Father’s Day, and sign them from her. These are the books with the special daddy-daughter theme. Is there some selfishness in all of this? Probably. I could spend an entire afternoon happily browsing the children’s section of the bookstore. I take joy in rereading my old favorites, and in finding new ones. But just maybe, as she grows, she’ll take pleasure in these books, too. And when she’s 30 (you know, EONS from now) she’ll be tracking some of these books down to put on her child’s bookshelves. So you see, it’s really not all about me.